As you can see from my last post (and the shelves in my living room!) I quite like analog cameras. Sadly getting the photos developed, scanned and printed has quite a cost attached to it and while I intend to do some developing at home, I haven’t quite got round to sorting out the equipment for it yet. Scanning is a different matter and due to the cost of proper scanners I’m forced to use a bit of a home-brew technique to get around that cost. Doing it the way I’m about to describe also makes printing easier as it effectively turns them into digital photos which can be printed at home or at Snappy Snaps. All photos used here as well as some more examples of test scans I’ve done can be found in the set on my Flickr. You will need: a film negative you wish to ‘scan’ (any size will do be it 35mm or 120 or whatever), a digital camera, a bright computer or laptop screen and Lightroom to do the processing. This entry was posted in How To, Photography and tagged how to, photography on April 8, 2011 by NickJonesMedia. 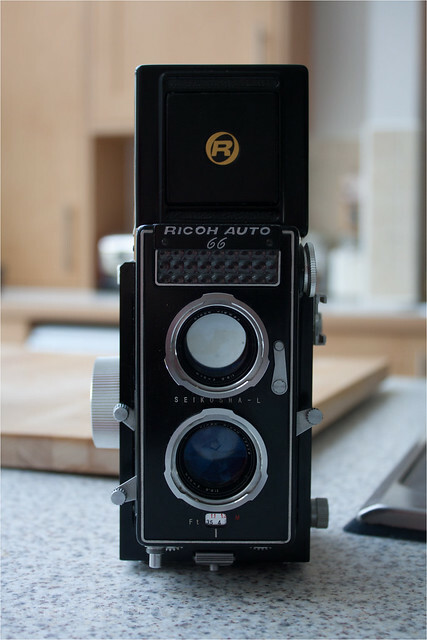 Every so often you’ll find a camera thats too pretty and too cheap to leave in the shop. I found one of these cameras. This entry was posted in How To and tagged how to, photography on April 5, 2011 by NickJonesMedia.